Home / Hugh's Books / The "B-Book". A new book medium in the making? The "B-Book". A new book medium in the making? But the format that has given the most joy over time, is the B-book i.e. the blog book. The B-book is a book that starts life out as a blog post. My first book, “Ignore Everybody” began life that way, as did my friend, Austin Kleon’s delightful classic, “How To Steal Like an Artist”. Sure, both became mainstream bestsellers later, but only AFTER their magic was already ignited all over the web. In B-book format, both have been seen by literally millions of people. “Ignore Everybody” has been downloaded well over 5 million times over the years, maybe 10 million. That’s an incredible number, really. Whereas most blog posts get buried and forgotten within days, often hours, B-books keep getting discovered again and again, passed around again and again, forever. The original Ignore Everybody is almost a decade old, and it still gets read by thousands of people, every month. Most conventionally published books can’t say that, not even close. The disadvantage is, of course, that it’s hard to get people to pay you for B-books. I never tired, frankly. I just assumed if enough people read them, I’d find a way to make a living from it in an indirect way, eventually. 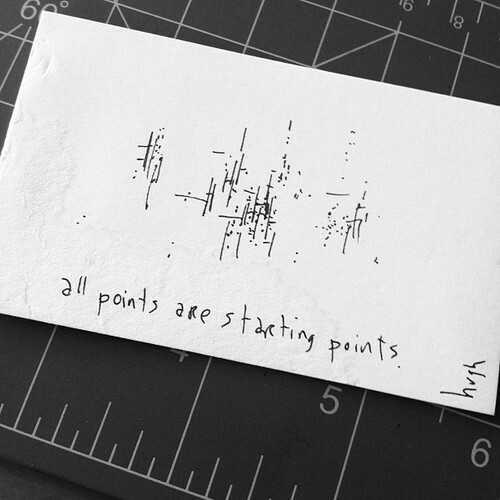 And time proved me correct: a lot of people who first discovered me via Ignore Everybody went on to become gapingvoid art collectors and/or corporate clients. Same is true for the other B-Books I wrote. “The Art Of Not Sucking” is my latest effort; I’m also currently working on another one about my client, Rackspace. True, the format may not be for everybody. I’m totally OK with that, to be honest. It’s an exciting medium that, although I’ve been working with it for almost a decade, I still feel like it’s new to me, it still feels like it’s a new world worth conquering. Like I said, it’s exciting. "I fell in love with my work and gave my life to it." Hugh, you are on fire. This last series of posts are all worth my sending to people I care about. Amazing. Both you & AK have been very inspiring. Thanks for all your “freewill”. I love that you wrote about this. I am currently working on a project (and strangely put the blog on hold to do it, should probably remedy that) that I really just want to share with everybody. 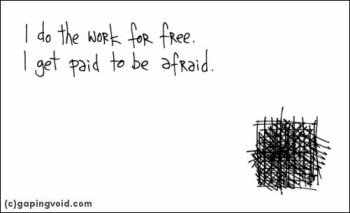 There’s so much grief out there about giving your work away for free that I feel guilty wanting to do that. Thank you for your thoughts. Cause I was going to do it anyway. 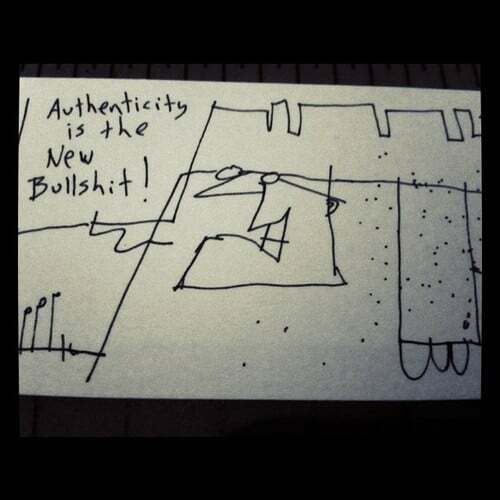 My latest e-book: "Authenticity Is The New Bulls**t"
My next book: "The Art Of Not Sucking"